We have the best beach right if front of Vulamanzi for drone fishing or bait boats come and stay and experience this area . We have 6 self-catering wooden cabins offering comfortable and clean accommodation. 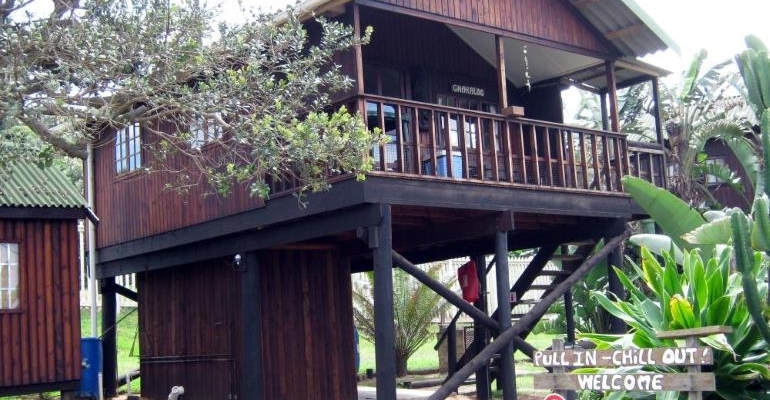 The cabins are nestled in the jungle-like vegetation with direct access to the beach only 50 metres away where you can enjoy surfing, snorkelling, fishing, kite boarding or just relax on the beach. We have 1 x 8 sleeper cabin, 3 x 4 sleeper open plan cabins, 2 x 2 sleeper cabins. We also have a fully equipped permanent tented camp that sleeps 2, it has 2 single beds and a small sleeper couch. We can accommodate up to a maximum of 28 guests, ideal for that big family get together which we call a block booking and have the whole resort to yourselves. Most of the cabins are elevated off the ground to give stunning views of the ocean. There are three 4-sleeper open plan cabins, two 2-sleeper cabins and the main cabin which has separate bedrooms that sleeps 8. All cabins are air-conditioned. There is also an entertainment area with pool table and darts board. Our recreation area is also very popular and includes a trampoline, volley ball area, and swimming pool as well as a jungle gym for the children. Unfortunately, no pets are allowed in High Season.